The Main level features a lovely open floor plan with large picture windows and beautiful pine hardwood flooring. 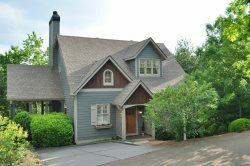 The home has an entry foyer, stacked stone wood burning fireplace and gorgeous great room with surround sound. The Indoor dining table seats 8-10. LCD TV over mantle with DirecTV. Comfortable screened porch/outdoor living room with stone accent wall. Oversized main level deck with dining area for 10, and New Weber propane grill. Fully stocked gourmet kitchen, with upgraded cabinets, granite countertops and designer tile backsplash. Kitchen includes a dishwasher, Gas stove/oven, microwave/convection oven, refrigerator/freezer/ice maker, stainless steel cookware, bake ware, spices, glassware and large walk in pantry. Spacious King Master Bedroom on main with two large closets, Large Ensuite Master Bathroom featuring heated tile floors and separate walk in shower, plus jetted garden tub. TV in armour with DirecTV. Upstairs there is a sunny loft/sitting room, and two generous bedrooms (one king, one queen) with a Jack-n-Jill bathroom offering private sinks and linens closets. Both bedrooms have spacious walk-in closets. The Queen bedroom has DirecTV. The Terrace/Basement level features a lovely open living room with second stacked stone wood-burning fireplace, DirecTV above fireplace and lots of comfortable seating. There is a LCD TV over Fireplace Mantle with DirecTV. There are (2) Queen bedrooms and an additional shared bathroom on this level.